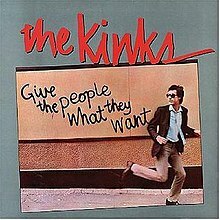 THE KINKS: GIVE THE PEOPLE WHAT THEY WANT: 1981: 4 STARS OUT OF 5 STARS: The title track, Destroyer, Predictable, Art Lover and Better Things which was released as a single- my favorite cuts on this album. This is another rock and roll album- leaving the theater albums of the mid 70’s a fading memory. 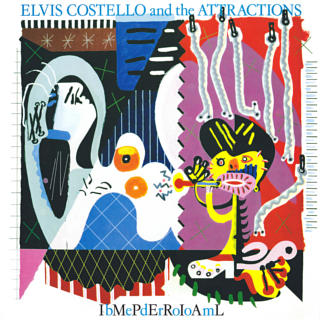 ELVIS COSTELLO: TAKING LIBERTIES: 1980: 5 STARS OUT OF 5 STARS: Elvis was a songwriting machine in the late 70’s -to mid 80’s- an album a year at least- and this which was a collection of 20 songs- most of them outstanding- which were b-sides or unreleased tracks. Even his throwaway songs were great. This was a U.S. release only- in the UK an almost identical release was called Ten Bloody Marys and Ten How’s Your Fathers. 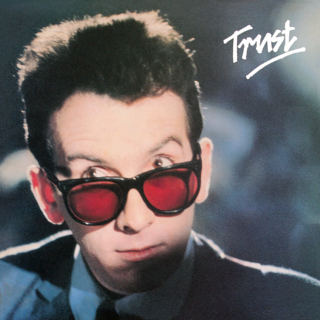 ELVIS COSTELLO: TRUST: 1981:5 STARS OUT OF 5 STARS: An album that at first release I liked a lot- but thought was a slight drop off from the first four- but with nearly 40 years of listening to it- no it’s just as strong and probably EC’s most underrated album. Elvis would later say about the album-” This was easily the most drug-influenced record of my career … It was completed close to a self-induced nervous collapse on a diet of rough ‘scrumpy‘ cider, gin and tonic, various powders … and, in the final hours, Seconal and Johnnie Walker Black Label. 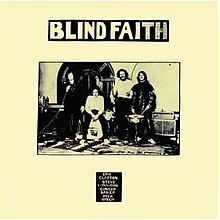 BLIND FAITH: BLIND FAITH: 1969: 4 STARS OUT OF 5 STARS: A super group that released one album- went to #1. Eric Clapton, Steve Winwood, Ginger Baker and Ric Grech. The two standout classic songs- Can’t Find My Way Home and Presence Of The Lord. and a Buddy Holly cover- “We’ll Alright” the highlights- 6 songs on the album. The album is probably more famous for the controversial album cover than for the music inside though. MILES DAVIS: IN A SILENT WAY: 1969: 5 STARS OUT OF 5 STARS: The album that kicked off Miles Davis’s fusion period. I like his traditional jazz recordings better but the fusion stuff is great too. Probably my favorite jazz musician to listen to overall. QUICKSILVER MESSENGER SERVICE: HAPPY TRAILS: 1969: 2 1/2 STARS OUT OF 5 STARS: A 1960’s San Francisco band when San Francisco was the hot music scene- – like The Grateful Dead and Jefferson Airplane- except they didn’t make it as big or as long. This is a highly acclaimed album- I have heard of the group before but until now haven’t actually heard them. I am not wild about it- at times it sounds like The Dead- but what the band lacks is a great singer like Jerry Garcia. Too much jamming- not really into that. I can see why it is considered a very good album- it is on the 1001 albums to listen to list- but just not the kind of stuff I dig. 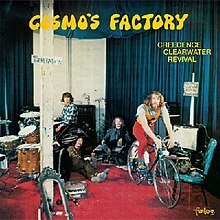 CREEDENCE CLEARWATER REVIVAL: COSMOS FACTORY: 1970: 5 STARS OUT OF 5 STARS: CCR at their peak- their most famous and probably their best album. Travelin’ Band, Lookin’ Out My Back Door, Run Through The Jungle, Who’ll Stop The Rain, As Long As I Can See The Light all CCR classics plus an 11 minute cover of I Heard It Through The Grapevine. CREEDENCE CLEARWATER REVIVAL: PENDULUM: 1970: 3 1/2 STARS OUT OF 5 STARS: This was CCR’s 6th album release in a period of 2 1/2 years. There is a drop off from the past albums- Have You Ever Seen The Rain? and Hey Tonight were singles the rest of the album not terrible but not up to the usual standards that CCR had set. This was Tom Fogerty’s last album with the band. The sound on this album different from the earlier guitar driven sound of CCR- keyboards and horns were taking over. 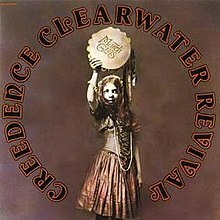 CREEDENCE CLEARWATER REVIVAL: MARTI GRAS: 1972: 1 STARS OUT OF 5 STARS: This is one of the worst albums ever by a major artist/ band. Fogerty’s Revenge as would have been a better title for it- as critic Jon Landau called the album. The last CCR album- a lot of infighting in the group- John Fogerty split everything between the three members- Fogerty only wrote 3 songs- and covered Hello Mary Lou. Someday Never Comes and Sweet Hitch-Hiker written by Fogerty were minor hits. 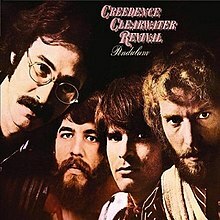 CCR’s final album. Only worth owning if you are a completest. 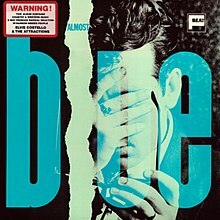 ELVIS COSTELLO: ALMOST BLUE: 1981: 4 STARS OUT OF 5 STARS: When I first heard that Elvis had gone to Nashville and was making an album of country covers my first reaction was it had to be a joke. Now today knowing what I know nothing Elvis would do would be surprising musically. He got George Jones producer- Billy Sherrill who was something of a madman to produce him. The album is pretty good. Elvis covers among others Merle Haggard, Gram Parsons, Don Gibson, George Jones and Charlie Rich. ELVIS COSTELLO: IMPERIAL BEDROOM: 1982: 5 STARS OUT OF 5 STARS: Up to this point- this was EC’s 6th album studio album of material he had written- not counting Almost Blue- the country covers album and Taking Liberties- the album of odds and sods- six albums and I have all of those albums at 5 stars. The streak would end with the next album. I saw Elvis for the first time while he was touring for this album. Two nights in a row at the Stanley Theater in Pittsburgh- one night Elvis- the next night The Clash. It can’t get better than that. Imperial Bedroom- a great sounding album produced by The Beatles enginner Geoff Emerick. It was recorded at the same time and the same studio as Paul McCartney’s Tug Of War- Emerick was working as an engineer on the McCartney album- his best in years. Give The People What They Want was the first new album I bought from the Kinks… Around the Dial stuck with me for some reason…I like most of the songs on that album. I saw them not too much longer… Hopefully again soon. That was a good one- I listened to State Of Confusion this morning- another good one from them..
Yes…State of Confusion is the tour I saw them on… the covers of the two albums resemble each other. Very hard to believe… I was 14 when Give The People What They Want was released. The line on that album “paranoia will destroy ya” stuck with me through the years. A good line- and the truth! Ray has come up with some great lines- and songs over the years! I’ve got Birth of the Cool and On the Corner of Miles Davis but they haven’t gotten a lot of listen, only just because I’m too A.D.D. to sit and just listen, as that’s what these two will take. I’ve got the Blind Faith one on the way from the library. I’ve also got the list of the EC albums. Hans you are keeping me busy compiling lists! I will be listening to The Birth of the Cool in a day or two – it is on that 1001 albums list! A guy I was connected with years ago lived near Chicago and was really into Miles Davis. He said that was the first one I should listen to. Maybe I will listen to it also so I can know what you’re talking about when you do. No surprise it is on the 1001 list!